Question Ysolda about an interesting note you found on a dead Orc. Upon reading Ysolda's Message found on Ulag's corpse. Ysolda will purchase Sleeping Tree Sap. Search Ulag's corpse for Ysolda's Message. Speak to Ysolda in Whiterun. Travel to Sleeping Tree Camp and find the cave inside the camp, northwest of the Sleeping Tree. Enter the cave and start your investigation. It would be a wise choice to leave the giants and their herd mammoths in peace, especially if you are low level. Move swiftly and enter the cave before they turn hostile to you. Ulag's corpse can be found on a stone inside the cave with a giant wandering nearby. Search his body, where you'll find Ysolda's Message and a sample of Sleeping Tree Sap. If you don't want to fight the giant, get out of the cave with the message as quickly as possible. After reading the message, you'll get an idea about what caused Ulag's death. There was an arrangement between Ysolda and Ulag for purchase of the sap, which Ulag would obtain from the Sleeping Tree. Unfortunately, he risked the wrath of the giants one too many times, and ended up paying with his life. 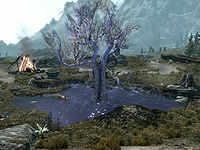 Travel to Whiterun and speak to Ysolda about the note you found. Ysolda will quickly realize what happened and offer you the same arrangement she had with Ulag, 150 gold for each sample of sap you bring to her. She'll be satisfied with the deal and remind you "Be sure to bring any more Sleeping Tree Sap you find to me." You may also ask her for more information about the Sleeping Tree itself. The Official Skyrim Patch 1.5 makes Ysolda essential (to alleviate issues with the A Night To Remember quest, though it also prevents you from accidentally failing this quest as well). The following empty quest stages were omitted from the table: 0, 2, 3, 4, 5, 100. On the PC, it is possible to use the console to advance through the quest by entering setstage dunSleepingTreeCampQST stage, where stage is the number of the stage you wish to complete. It is not possible to un-complete (i.e. go back) quest stages, but it is possible to clear all stages of the quest using resetquest dunSleepingTreeCampQST. This page was last modified on 24 January 2017, at 06:36.